In this interview recorded during the 2018 Black Alumni Reunion, Afua Hassan and Wanda Moore discuss their time at Brown University, the effect their education had on their careers, and the importance of their friendship, which strengthened when Moore became pregnant in her junior year. The two explain that their friendship and Hassan’s desire to document her work as a midwife of color and midwifery in communities of color drove them to donate this interview. Wanda Moore gave birth to her son in April 1982, just before the notorious blizzard of that year. She then raised her son while also working and completing her undergraduate degree at Brown. Having returned to Providence for a time to complete course work towards her own degree, Hassan lived with Moore, helping to care for the baby. Moore goes on to describe life on campus as a pregnant woman and she narrates her birth story. Hassan then begins a longer discussion of her career as a midwife in Houston, Texas and the contentious politics that are involved in the field, specifically in relation to race inequality and women’s general misinformation when seeking out prenatal care. Hassan shares anecdotes of working with women and their partners during the birth process and the effects the expansive geography of Texas can also have on women’s access to healthcare. She recalls couching a father by phone through an emergency delivery of their child while in route to the hospital. Moore concludes the interview by describing why she chose Brown, the importance of the Third World Transition Program and how it affected her relationships on campus. Biographical note: Afua Hassan grew up in New Haven, Connecticut and was always expected to attend an Ivy League institution. Her mother was a school teacher, and her father was a third-generation college student, but she was told during high school that she would not get in where she was applying. Nevertheless, Hassan did apply to Brown and was admitted, officially graduating in 1981 though completing final coursework in 1983 with an A.B in African American Studies after also studying Pre-Med. In 1981, Hassan intended to study to be a midwife and so moved to Houston, Texas, because at the time, Texas was one of the only states where one could directly enter midwifery school and become a practicing and licensed midwife without being a registered nurse. Hassan graduated from the Houston School of Midwifery in 1984. After three years of attending school and three years of teaching, Hassan practiced for ten years with others before finally working on her own. In 2011, Hassan founded The Birthing Place, the only freestanding birthing center owned and operated by an African American midwife in Houston. Hassan has been in Houston ever since leaving Brown, coaching and caring for mothers before, during, and after giving birth. Hassan has assisted in over 800 births. Wanda Moore was born in New Jersey and was advised to apply to Brown for university. 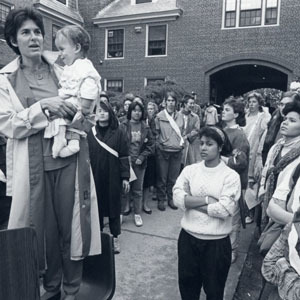 During her undergraduate career, Moore studied abroad, and upon return, gave birth to her son in April of 1982. Living off-campus, Moore worked and raised her son, while simultaneously finishing her Bachelor’s degree. In 1983, Moore graduated with a degree in Political Science, a minor in English, additionally receiving a Secondary School Teacher’s Certification in English, Political Science and Government. She then went on to get a law degree at Northeastern University School of Law. Following the completion of her degree in 1986, Moore moved back to New Jersey where she worked as a judicial law clerk, and then as an assistant deputy public defender (1989-2007). From 2003 to 2007, she was the Deputy Public Defender for Intensive Supervision Program and Drug Court Director; in 2007, she worked as the Director of Prisoner Reentry; and in 2016, Moore also took a position as an adjunct professor at Rutgers University, School of Criminal Justice. Today, Moore is the director of the New Jersey Urban Peace Building Project for the Global Peace Foundation, where she helps “implement a grant received by the Department of Homeland Security to engage diverse community leaders, stakeholders, frontline youth workers, educators, social service professionals, law enforcement and faith leaders to help prevent targeted violence while strengthening social cohesion and community supports.” (Quoted from Moore’s LinkedIn page).